Adzom Gyalse Gyurme Dorje (Tib. ཨ་འཛོམ་རྒྱལ་སྲས་འགྱུར་མེད་རྡོ་རྗེ་, Wyl. a 'dzom rgyal sras 'gyur med rdo rje, 1895-1969) aka Agyur Rinpoche (Wyl. a 'gyur rin po che) — the third son and student of Adzom Drukpa. He was recognized by Jamgön Kongtrul as an emanation of Orgyen Terdak Lingpa. Adzom Gyalse Gyurme Dorje was the third son and student of Adzom Drukpa Drodul Pawo Dorje. His mother was Tashi Lhamo (Tib. bkra shis lha mo), the daughter of a popular merchant named Budo (Tib. 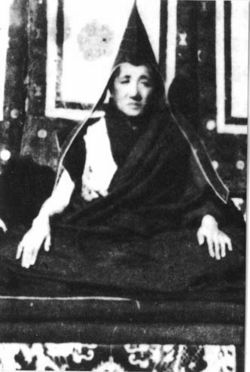 bum dos), who became Adzom Drukpa’s spiritual wife at the recommendation of Jamgön Kongtrul. While regarded as the incarnation of several eminent master, Adzom Gyalse was recognised as the incarnation of Minling Terchen Gyurme Dorje. Adzom Drukpa oversaw the spiritual education of Adzom Gyalse and transmitted to him especially his own terma treasures and the teachings of the Great Perfection such as the Longchen Nyingtik and the Chetsün Nyingtik. These in turn became also the main focus of Adzom Gyalse’s study and practice. Thus Adzom Gyalse rose to become of the main holders of the lineage and transmission of the Great Perfection teachings. Adzom Gyalse took over the legacy of his father and became responsible for, the by his father in 1886 established, Adzom Gar (Tib. A ’dzom gar). Unlike his father, Adzom Gyalse took monastic ordination and remained a monk throughout his entire life. He further developed and expanded Adzom Gar and became its main teacher and holder. While Adzom Gyalse had the potential to become a great tertön he decided to focused instead on the preservation and continuation of existing practices and teachings. In 1958, Adzom Gyalse was arrested and put in prison where he gave teachings to his fellow inmates. He passed away in 1969 with many miraculous signs, and left a letter predicting the date and place of his future rebirth and the names of his future parents. In accordance with this letter, Dilgo Khyentse Rinpoche recognised a child born in Bhutan in 1980 as the reincarnation of Adzom Gyalse Gyurme Dorje. This child became a monk at Shechen Monastery and received numerous teachings and initiations from Khyentse Rinpoche. Amongst Adzom Gyalse’s many compositions, his commentary on Samantabhadra’s Aspiration to Good Actions (Skt. Bhadracaryapraṇidhānarāja, Tib. Bzang spyod smon lam) entitled The Excellent Mahayana Path of the Sacred Instructions of the Accomplished Scholars (Tib. mkhas grub dam pa’i zhal rgyun theg chen lam bzang) and concise commentary on the Guhyagarbha tantra entitled A Drop of Amrita (Tib. bdud rtsi’i thigs pa) became especially renowned. Adzom Gyalse commissioned many of the famous Adzom Gar woodblocks, which became vital in the preservation of important text of the Ancient School. Adzom Gyalse was succeeded as the holder of the Adzom lineage and Adzom Gar by Thubten Padma Trinle (Tib. thub bstan padma phrin las, 1926-2001). Adzom Gyalse’s main biography entitled A Reflection of the Moon in Water (Tib. chu zla’i snang brnyan) was compiled by Padma Kunzang Rangdrol (Tib. padma kun bzang rang grol, 1890-1973). Adzom Gyalse Gyrume Dorje’s writings were compiled in five volumes and preserved at the Adzom Gar. Adzom Gar was established by Adzom Gyalse’s father, Pawo Dorje and it served as Adzom Gyalse’s main seat. Woodblocks of Adzom Gyalse’s writings were carved at Adzom Gar. The prints of the woodblocks of Adzom Gyalse’s collected works were published in 199? in Pelyul Dzong (Tib. dpal yul rdzong) by the printing press Kardze Börik Rangkyong Khül (Tib. dkar mdzes bod rigs rang skyong khul). The original manuscripts of Adzom Gyalse’s writings, from which the woodblocks were prepared, may likely still be preserved at of Adzom Gar. While Adzom Gyalse’s main spiritual teacher was his own father Adzom Drukpa, his other teachers include many of the most prominent teacher of the time, such as Khenpo Ngawang Palzang, Katok Situ Chökyi Gyatso, Khenpo Kunzang Palden, Dodrupchen Jikme Tenpe Nyima, Thupten Chökyi Dorje, Khenpo Thupten Nyendrak (Tib. mkhan po thub bstan snyan grags, 1883-1959), Sera Khandro and Ayu Khandro Dorje Peldron (Tib. a g.yu mkha’ ’gro rdo rje dpal sgron, 1839-1953). His main students include Thubten Padma Trinle (Tib. thub bstan padma phrin las, 1926-2001), Padma Kunzang Rangdrol (Tib. padma kun bzang rang grol, 1890-1973), Könchok Rinchen (Tib. kon mchog rin chen, b. 1922-? ), Dilgo Khyentse Rinpoche, Nyoshul Khen Rinpoche, Jazi Amnye Drodul Pema Garwang Lingpa (Tib. ja bzi a myes ’gro ’dul padma gar dbang gling pa, 1901-1975), Tsunma Yulha (Tib. btsun ma g.yu lha, 1901-1980), Gojo Kharlek (Go ‘jo mkhar legs, ? ), Padma Tsewang Lhundrup (Tib. padma tshe dbang lhun grub, 1931-2001), Rago Choktrul (Ra mgo mchog sprul, ? ), Orgyen Rangdrol (Tib. o rgyan rang grol, ? ), Khyentse Rab Senge (Tib. mkhyen rab sengge, ? ), Karma Droje (Tib. karma rdo rje, ? ), Thubten Changchub Gyaltsen (Tib. thub bstan byang chub rgyal mtshan, b.1943-? ), and Sangngak Tendzin (Tib. gsang sngags bstan ’dzin, 1917-1956). ↑ Nyoshul Khen Rinpoche, A Marvelous Garland of Rare Gems, translated by Richard Barron, (Junction City: Padma Publishing, 2005): 450. ↑ Following: “Gyalse Tulku,” on Shechen.org, http://shechen.org/spiritual-development/teachers/gyalse-tulku/. ↑ Nyoshul Khen Rinpoche, A Marvelous Garland of Rare Gems, translated by Richard Barron, (Junction City: Padma Publishing, 2005): 451. ↑ Most of the at Adzom Gar woodblocks print have been scanned by BDRC. ↑ Adzom Gyalse himself commissioned the carving of many important texts of the Ancient School. Adzom Gar played an important role in the preservation of important writings of the Ancient School. Most of the at Adzom Gar wood-blocks print have been scanned by BDRC. ↑ Samten Chhosphel, “Tubten Nyendrak,” on The Treasury of Lives, http://treasuryoflives.org/biographies/view/Tubten-Nyendrak/9588. ↑ Joona Repo, “Ayu Khandro Dorje Peldron, ” on The Treasury of Lives, http://treasuryoflives.org/biographies/view/Ayu-Khandro-Dorje-Peldron/13139. ↑ Sangngak Dorje, “Jazi Amnye Drodul Pema Garwang Lingpa” on The Treasury of Lives, http://treasuryoflives.org/biographies/view/Jazi-Amnye-Drodul-Pema-Garwang-Lingpa/P8850. ↑ Sonam Dorje, “Tsunma Yulha,” on The Treasury of Lives, http://treasuryoflives.org/biographies/view/Tsunma-Yulha/P4. Nyoshul Khenpo, A Marvelous Garland of Rare Gems: Biographies of Masters of Awareness in the Dzogchen Lineage, Padma Publications, 2005, pages 450-454. This page was last edited on 5 October 2018, at 08:25.